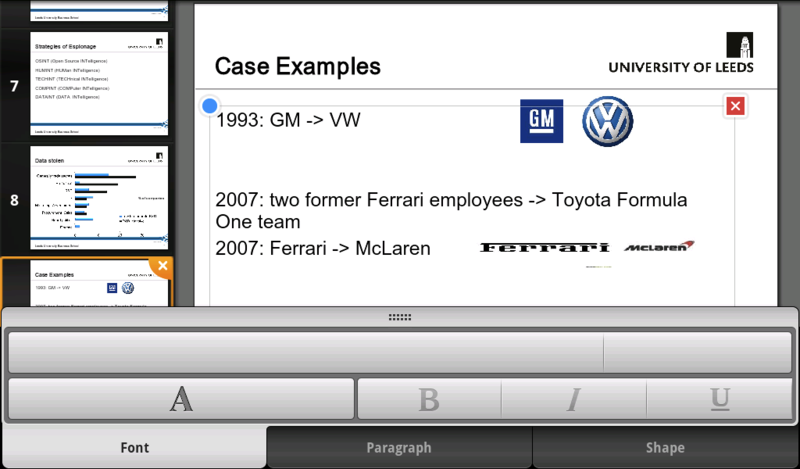 To read lecture handouts I used Quick Office Pro HD, I used free office for a bit but I found this too limited. Another problem was whilst taking notes with lecture handouts was that the entire screen would be switch to white space to input text, a split screen with 50% lecture note & 50% white space to take notes would be much more convenient. Did I stop using paper handouts? No, because of the above stated, I prefer writing/taking notes whilst seeing the lecture slides at the same time. I have yet to write a complete essay on my tablet but I keep school material on DropBox (cloud computing) and usually open my seminar notes to further expand them. However I still feel that writing on paper is still more efficiently than trying to type fluently on a 7 inch tablet. Again like working in PowerPoint, I feel that the tablet keyboard takes up much too much space. I do find myself doing a lot of reading of topic-related material on my tablet (PDF). I would even say I prefer reading PDF’s on my tablet than paper/computer screen, just much less straining on my eyes. However while writing this blog, I tried to highlight some text out of a PDF through the Amazon Kindle app and take a screenshots of it but I couldn’t. I have not yet needed to highlight any material out of a PDF but will try out easyPDF as the Kindle app is falling short in functionality. If I want to transfer files through USB in Android I just have to enable the USB mass storage option in “Settings”. When connected my android device shows up as a mass storage usb device in Finder (Macintosh) and I can just drag and drop files from my hard drive. No need for additional software. The screenshots are taken by holding Power + Back and show up in the Screenshot folder. 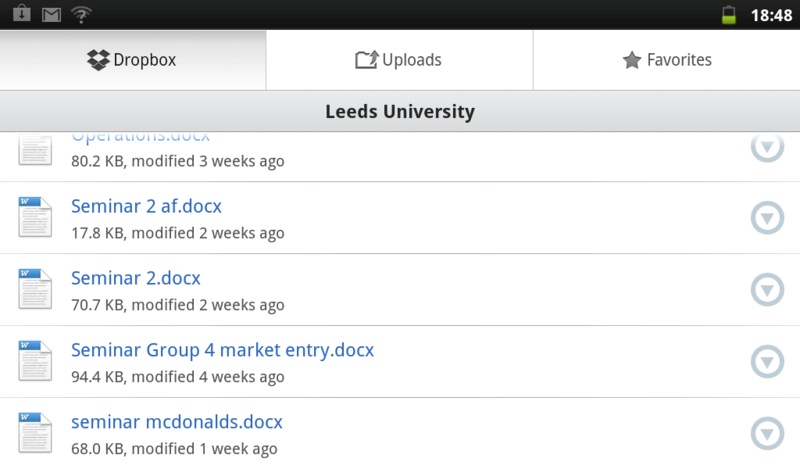 I use DropBox (cloud storage) for school related documents, so all my documents are available on a cross platform of devices and I don’t need to transfer them manually. I tend to do both methods just to be safe I don’t have any files missing. So after the meeting, what I found very useful in exchanging experiences and opinions by the way, I had set my mind on using Quick office pro open the lecture slides and use to follow the classes. I must admit, when the lecturer is explaining something, I find that I am much more attentive when looking at the slides on my tablet than if I were to pay attention to the projected presentation. However, I found the screen size a limitation on the 7’’ galaxy as when taking notes. The entire screen becomes a notepad and I can’t see the presentation anymore. (a split screen would have been nice). Also, something I find very annoying in quick office if is that I by accident press on the home or back button I get slung back to my homepage and my document did not auto save! So today at the end of BRICs this occurred and my entire document was blank. I was not a new document so auto saving should have occurred in my opinion, or at least the question if I want to save. A product related issue however is the battery, for some reason it completely drains after 3 days… Even if the battery still is at 70% the second day, in the morning of the third day it won’t even boot anymore. Annoying, however this may just be my device. I’m extremely pleased with the email client, I have it also on my phone enabled but a bigger screen makes checking the university mailbox and sending emails so much more convenient. Also I seem to stay much more updated on current affairs concerning emerging markets, economics etc. through the BBC, Bloomberg apps. I also have them installed on my phone but performing these tasks on a tablet is just so much more enjoyable and convenient. Even though HTML5 or 5HTML is the new standard, a lot of older sites still are in flash, just convenient. However the VLE is annoying, it’s not at the VLE it’s at android operating system. It’s laggy and sometimes my touch pad is oversensitive in the VLE. The past week I actually got started using my tablet. After some battery issues on my galaxy 7” monday & tuesday. (battery drained/wouldn’t start up). however after Juice Defender Ultimate I am more satisfied with the battery. (can play a full day with it ). 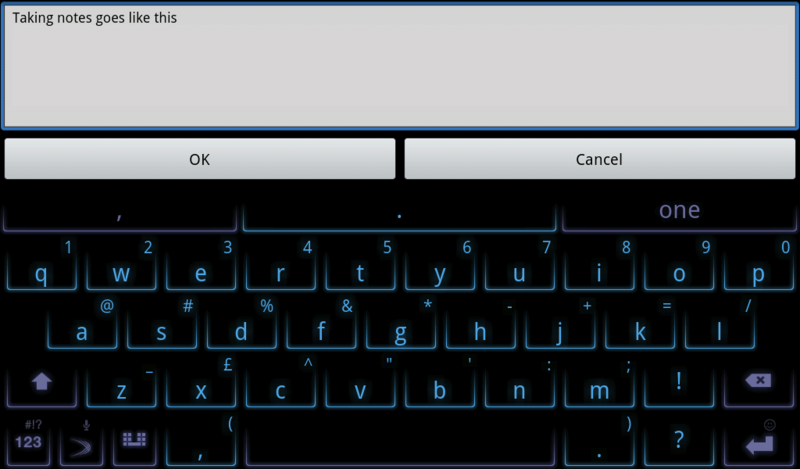 Another app for android to increase productivity if swift key tablet x, when holding the tablet in landscape you get a more centered keyboard around the sides for typing with thumbs. quite convenient. having previously worked with iPads (parents) I always found them a big too big to carry around whiteout having a backpack or any kind of bag. The 7” inch galaxy is perfectly portable in daily life without a backpack or whatever. I am using the application for word processing quick office pro & also office suite trial versions, I will most likely purchase quick office. I like the convenience of just typing preparations for seminars at home, synchronizing it with dropbox and pulling it up again in the seminars through Dropbox. However, Taking notes on 7 inch screen just is not efficient in my opinion. I still prefer using pen & paper. I have still to set-up my school mail account on my tablet, I will ask David or Chris Gray or so to assist me in this. Also revising with a tablet is well-efficient, no distractions such as a with a laptop and very easy to just lay next to my textbook and go through a PDF research paper. I’m tried to replace my iPod Classic with my Galaxy Tab & Google Music as a daily music player but I must already cave in and state that the iPod Classic is still a better daily music player. I would however say that Google Music is so far the best tablet music player I have experienced. For Movies I am disappointed with Samsung for advertising it can play certain movie formats while in reality it can not without lagging. (mkv). I’m also using the Amazon Kindle app as a eBook reader as I have got previous good experience with Amazon. I am currently reading Treasure Island, It is a good book. Also I have purchased Beautifull Widgets, unlike the iPad you’ve got a “home screen” just like a phone and on this home screen you can place Widgets for the Weather for example, of active apps running or a youtube widget that displays the most popular videos. These where my experiences the past week. I’ve bought the previous Samsung Galaxy Tab 7” model from 2011 and am using it with an OS X platform. I’ve so far had it 1 day. I updated my Android Tablet to Gingerbread 2.3 through the official update that samsung supplied but however I found afterwards that the Samsung Kies software suit did not recognize my Tablet anymore! This meant that I cannot use any of the Samsung pre-installed apps as they all require to sync media (photos/music) through the Samsung Kies suite. I think this is really bad on samungs part as this tablet is 1.5 years old and already totally not supported anymore! On another note I found that the pre-installed samsung apps such as Movies usually just take me to a website and that was it. The pre-installed samsung ebook app was an exact copy of iBook, not necessarily bad but again very limited. Another annoyance on Samsung’s part was the fact you can’t remove any of these pre-installed apps, unless you “Root” your Android device. But having worked with Samsung laptops before, that’s exactly what I expected. Shortcoming preinstalled software. I have not installed a productivity office suite yet but will do it this weekend and test it next week in class, I’m also planning to test several movie/ebook/music apps.